Plein Air paintout from an open-top bus! Paint Out artists on the bus. 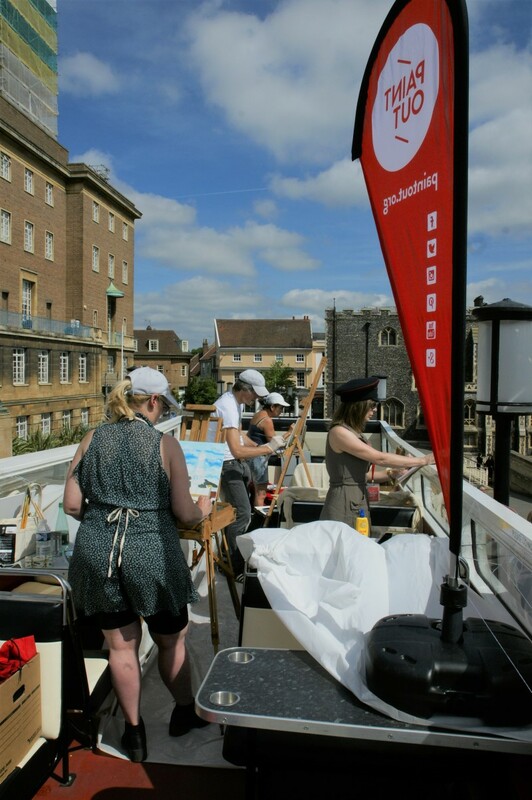 Paint Out‘s first public en plein air art event of 2017 saw a dozen or so artists find fresh views and a new perspective of Norwich seen across the Market to the Castle, the Guildhall, and St Peter Mancroft, on a sunny bank holiday weekend Sunday. The vision of James Colman to keep landscape artists challenged by looking at the urban environment in new ways has seen a hundred artists gather on Mousehold Heath in 2015 for panoramic views of Norwich, and in 2016 saw artists amass in Tombland and take to canoes on the River Wensum. 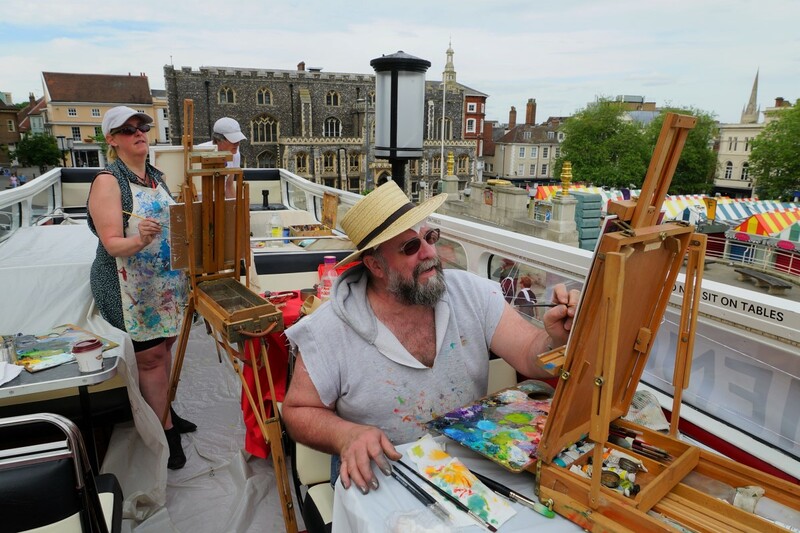 Last weekend was the turn of an open-top double-decker bus, supplied by Dolphin Travel with amiable driver, Andrew – who also supplied the Guardians of the Galaxy soundtrack that kept the artists painting in the hot sun during the afternoon session. As well as members of the public including an artist’s teenage son joining in, there were Paint Out regulars including the artists: John Behm, Mary Brady, Karen Adams, Jack Godfrey, Mary Kallagher, and James Colman himself. Some artists like Jan Halliwell travelled down from Lincolnshire to join the Norfolk paint out on the streets of the city, alongside the bus. Paint Out welcomes experienced artists to its juried-entry art competitions but also runs public entry paint-outs for artist of all ages and abilities to encourage people into discovering and furthering their artistic creativity. Art skills workshops were run the day before to tutor budding and honed talents alike. 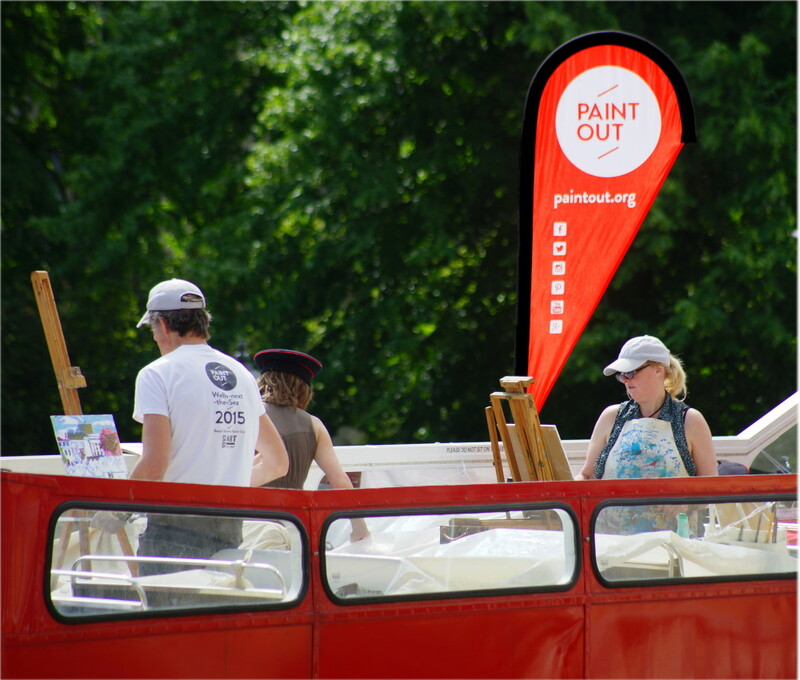 “The Paint Out bus this weekend provided us with a fantastic hub from which to tell the world about our forthcoming 2017-18 programme plans. Our artists found their elevated experience inspirational. 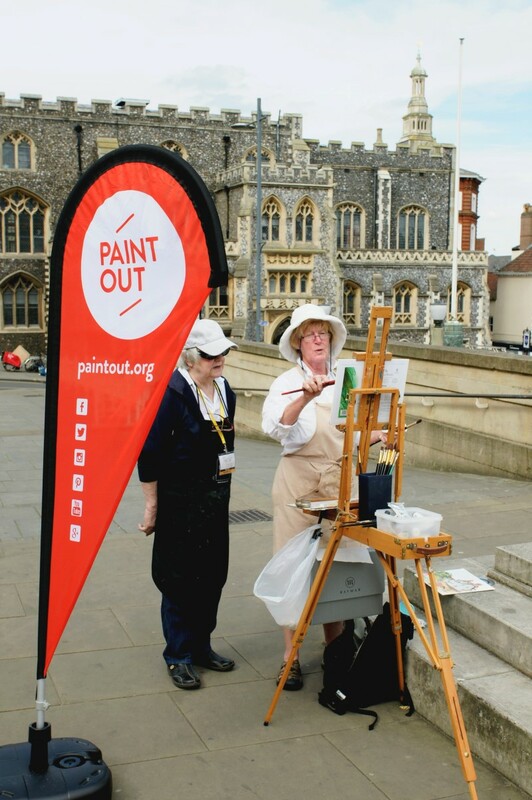 Paint Out will be popping up again as guests of the two-day Royal Norfolk Show, June 28-29, and then at our full plein air painting competition events at Wells-next-the-Sea, 15-17 September, and at Norwich, 15-17 October.